Since its 2008 launch, FRN has been one of the fastest growing reward programs in the US. Centered on the premise that discounted gas is attractive to most consumers, FRN has built a coalition of retailers, restaurants and grocers offering a single reward: cents-per-gallon savings on gas. One of a coalition loyalty program's strongest features is enabling members to earn and accrue rewards more quickly than with single-operator loyalty programs. FRN opens up the potential for members to never pay full price at the pump again. In most coalitions, points are the standard reward mechanism. UK's well-known coalition, Nectar, is a great example. Its members earn points at its partners and can redeem them on a wide variety of rewards ranging from airline flights to cinema tickets. Since points are not actual rewards (but a means to a reward) FRN introduces an alternative coalition currency by offering just one reward: Fuel Reward savings - ie, automatic price reductions at the pump. FRN membership is free. Consumers sign up for an FRN account online () and link the FRN card and/or a grocery partner's loyalty card to the account. (To obtain the FRN card, order it online and have it mailed or pick one up at a Shell station). Fuel Reward savings are earned at program participants across various key sectors. Spending is cumulative: a member's account keeps track of all purchases within each program sector and adds them together. Members redeem Fuel reward savings at a Shell pump by swiping the linked FRN card or grocery partner's loyalty card. Note: For a detailed explanation of how each program sector works please see Table 3. In Table 1's example, swiping the FRN card or grocery partner's loyalty card at a Shell pump automatically reduces the price of gas $1.14/gallon. Nothing is more annoying to consumers than a wallet stuffed with loyalty cards, and earning Fuel Reward savings across all FRN program sectors involves linking and using multiple cards. This includes the FRN card, grocery partner loyalty cards as well as credit/debit cards in conjunction with grocery promotions and dining. A streamlined alternative for FRN to consider would be the "one card" model characteristic of coalition loyalty programs, ie, combining the separate loyalty programs onto a single magnetic stripe card that all program participants accept. Consumers crave simplicity, and having the same card for all coalition partners makes members more likely to carry and use it. Aside from ease of use, the one card model would also resolve some of the following issues. Fuel Reward savings can take up to 40 days to be credited to a member's account. As seen in Table 2, grocer rewards are credited immediately, whereas dining rewards can take over a month. This forces members to frequently monitor their FRN account to see what rewards are eligible for redemption. Table 2 also shows that members not only have to monitor their account to see if rewards have been credited, but also check to see which programs issued the rewards because they have different expiration dates. This is an unnecessary inconvenience for members. To avoid devaluing both the reward currency and the program, the ideal would be to have all rewards credited immediately with the same expiration period. Members have to register for a separate dining account in order to earn 'Dining Program' rewards at participating restaurants. The dining account asks for members to link up to 5 credit/debit cards, and pay for meals using one of the cards linked to the dining account. The dining account, separate from the FRN account, carries additional conditions such as members must opt to receive weekly dining promotional emails to remain in the 'Dining Program'. Of the 10,000 'Dining Program' restaurants, not all issue Fuel Reward savings daily. Members must check an online calendar next to each restaurant's listing to determine which days that week dining transactions will count toward earning rewards. Furthermore, some restaurants limit the number of visits per month for which members can earn rewards. Obviously, members would prefer a consistent set of "rules" governing all 'Dining Program' restaurants. Members can earn Fuel Reward savings by shopping online at over 700 name-brand merchants like Macy's, Target and Office Depot, but not in-store. 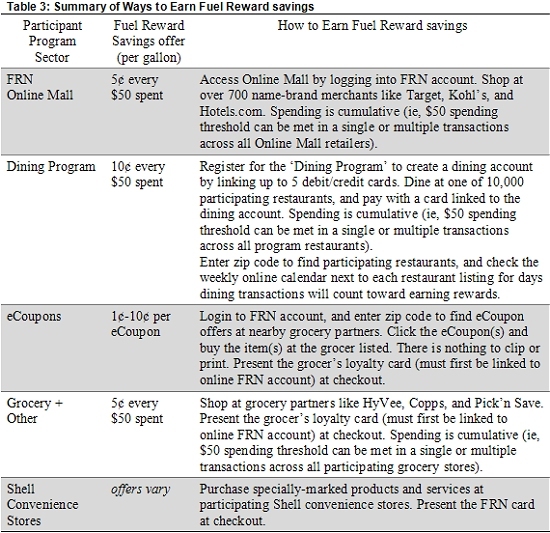 To earn rewards, members have to login to their FRN account and access the FRN Online Mall to shop at these retailers. To make earning rewards an everyday experience for consumers, FRN should consider allowing for in-store shopping at these merchants. eCoupons are simple to issue, and a valuable way to earn Fuel Reward savings. But the selection of eCoupons is limited, and not all partner grocers accept them. For example, only 7 eCoupons are currently offered within a 50 mile-radius of Greenville, SC's 29607 zip code. This issue seems to be one of the easiest to resolve to present more reward opportunities to members. Shell is the national redemption partner for FRN, yet not all Shell stations participate in the program. This means members have to go online and locate Shell stations where they can redeem Fuel Reward savings. Preferably, all Shell stations should participate in the program. Another redemption obstacle is seen with this month's offer of Quaker State motor oil at participating Shell convenience stores. It requires the following steps to obtain the 4c off/gallon savings with the product purchase: Present the FRN card at checkout; later, go online () and request a FRN rewards code be sent, then login to FRN account and enter the code (a valid receipt is also needed). Why this added impediment for such a simple low-value transaction? Presenting the FRN card at checkout should be sufficient. A coalition loyalty program offering gas savings that come from everyday purchases is undeniably attractive to consumers. FRN's alternative coalition currency of a single reward, cents per gallon savings on gas, is a landmark in loyalty coalition programs. In a well-run coalition the accrual and redemption of rewards is uncomplicated and effortless, mirroring an everyday experience and not just an occasional one. Transactions are simple and rewards are immediately credited to a member's account. While the basis and appeal of FRN is strong, the outlined issues stand in the way of its having a powerful, coalition currency used by many. Once FRN successfully addresses these issues, its ambition to become the first large-scale, nationwide coalition loyalty program could be realized; in short, making it a formidable key player in gas savings. The views expressed in this article are those of the author, and not necessarily those of the publisher or its partners and agents.